A survey found Pennsylvanians' favorite holiday treat is eggnog. A recent survey found that folks in Pennsylvania prefer eggnog to every other holiday treat during the Christmas season. 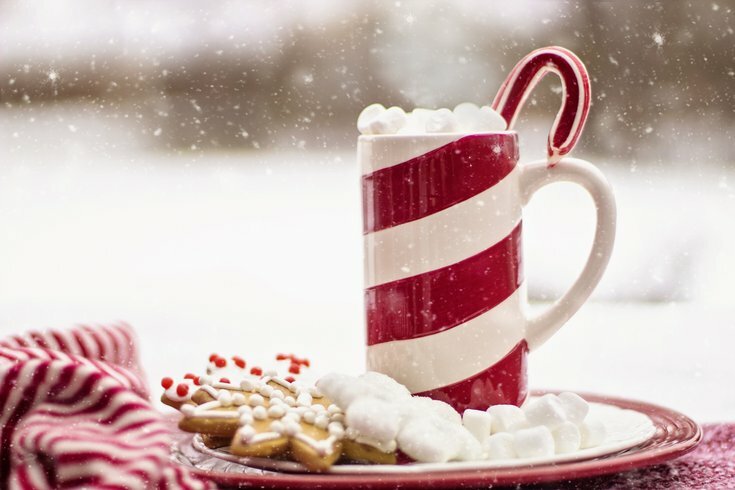 Offers.com asked residents of each state in the U.S. which treat they would choose among a candy cane, gingerbread, eggnog, pumpkin pie, fruitcake and peppermint bark. Pumpkin pie ultimately was the big winner nationwide, taking home 33 percent of the total votes (It was the favorite among New Jerseyans). But Pennsylvania and a few other states agreed on eggnog as their top pick, including Arkansas, Colorado, Mississippi, Nevada, New York, South Dakota, Utah, and Virginia. As a Pennsylvanian born and bred, I have proclaimed my love for eggnog — when made correctly. Eggnog is one of those things that will certainly divide a crowd. After all, it is made with raw eggs, alcohol, and lots of dairy. Understandably, many opt for other boozy holiday favorites like the Hot Toddy, spiked hot chocolate, or even a spiced Glühwein. "Eggnog purists" (apparently that's a thing) claim that if you don't like this drink, you just haven't had it prepared the right way. Sure, you could go out and buy the 30-proof pre-made mix at your local Fine Wine & Good Spirits made from a blend of rum, brandy and whiskey. Or, you could get the true nog experience and whip it up by hand. I tried it out this past weekend and learned about the traditional treat. What is eggnog and where does it come from? No one is entirely sure where the term "eggnog" comes from, but historians claim the drink got tied to the holidays when the British came over to America in the 1700s. Settlers had plenty of cows, chickens, and rum on-the-cheap, and thus, eggnog. The drink is made by combining stiffened egg yolks, egg whites, cream, alcohol, sugar and some spices. Creamy, alcoholic drinks have historically been quite popular. In fact, in Puerto Rico, coquito is made with rum and coconut milk, and in Mexico, rompope adds baking soda and lemon to its recipe. Doesn't eggnog use raw eggs? Is that safe? Yes. And, sort of? Scientists have been experimenting with eggnog recipes for quite some time to prove that it's safe to drink. Many argue the addition of alcohol kills enough of any potentially harmful bacteria that may be present to make it drinkable. While the CDC recommends never consuming raw eggs in any form, scientists have found a way around this. A lab at The Rockefeller University has been making eggnog for centuries. Starting in Thanksgiving, scientists let their homemade eggnog age until Christmas and then share it altogether. And to date, no one has gotten sick. If you're not convinced, the lab even did a test that involved putting salmonella cultures into the recipe to see if the alcohol would kill it over time. The experiment found that if you let the nog age about three weeks, any potentially harmful bacteria will die off. Don't believe me? Watch below. If you're still freaked out about drinking raw eggs, you can just buy it at the store. All those pre-made mixes use some sort of cooked eggs, so there's no need to worry. With science on my side, I prepared my eggnog recipe about two weeks ago. I had some rum in the freezer, so I used that. But traditional recipes call for rum, whiskey, and sherry. Some even add Cognac. That part is up to you. I used this recipe from "The Spruce Eats." It was quick and easy. In short, all you have to do is separate the egg yolk from the egg white, whip each part until it's stiff, add cream with vanilla and almond extract, and then mix all of them together slowly. Garnish with cinnamon and nutmeg. Hot tip: If you're going to make this stuff by hand, make sure to have an electric mixer. I whipped all of this by hand without a mixer, which took much longer than it needed to and killed my arm. The egg whites took especially long because they need to form peaks before they can be mixed with the yolk. There are a ton of recipes online with variations on this. Alton Brown delves into eggnog and does a how-to on the treat. And so does Martha Stewart.